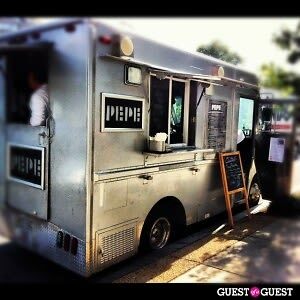 Pepe, the food truck by José Andrés, just got licensed to sell their sandwiches in Virginia and Maryland. We spotted the truck parked in Arlington's Crystal City on Wednesday for a media lunch, and we look forward to seeing it in Bethesda, Rosslyn, and other truck food meccas soon. In addition to the sandwiches, I must note that the non-alcoholic Pepe Tonic beverage is ridiculously amazing. It is a carbonated drink that starts off tasting like a mild Sprite, then ends up with a warm chai/nutmeg/cinnamony flavor.